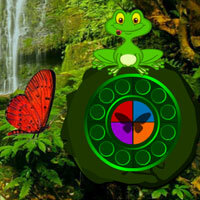 BigEscapeGames - BEG Big Butterfly Land Escape is another point and click escape game developed by Big Escape Games. In this game, you came to see the beauty of a butterfly land. But unfortunately, you missed the way out. There is no one to help you. You have to find the way to escape from there by finding useful objects, hints and solving puzzles. Click on the objects to interact with them and solve puzzles. Good luck and have fun! Going in. I've really enjoyed thelast few games from this developer. The 6x5 green buttons puzzle is trial and error. The path lights up when you click the correct button. On the green symbols circle 1 is at the top. This developer is living up to its name. That was HUGE!! Great game. Thanks. Back and out now. That was great. The thing that held me up most was finding my last grasshopper on the ground beneath an orange butterfly. Three stars?! The last 3 or 4 games by this developer have been amongst the best of the year. I can't get to the second seen because i can not figure out the green square puzzle. Spoiler please. Thanks so much to Methanwy for the snaggy. Never would have figured out those butterflies! For the green squares: Trial and error but I did the first row, 1 green square in position 2, the second line: 1 green square in position 1, the third line: 1 green square in position 3. Couldn't understand the clue. Oh and thanks Dazz for shaggy and thanks Karen for clue on green squares. Loved this Game!!! TY BEG! The clue for the 3x4 green squares with butterflies is on a rock in the scene with the yellow "2" in the first set. For the 5x6, click the yellow circle, then the circle directly to the right. They will be connected by a line. Continue this (trial and error) until you connect to the red.